Known as one the most innovative Belarusian poets as well as a literary scientist, translator from French and Slavonic languages and a songwriter, Khadanovich is also the head of the Belarusian PEN-center. Poetry writings of Khadanovich are specific for their original character, the critics also pay attention to his experimentation with their form and style. Khadanovich likes to connect the "high" and the "low" genres. Besides that, he also experimented with the limerick genre and, in 2005, released a collection named "Countrymen, or Belarusian limericks" (Землякі, альбо Беларускія лімерыкі), where, with the use of the precise poetic form and absurd content, he presented an original view over the Belarusian cities and countryside. 10 collections of poetry writings were published under his name, among which a collection of intellectual and, at the same time, optimistic and accessible poetry named "Old Poems" (Старыя вершы, 2003), or a collection named after the "Letters From Under the Gallows" by Kastus Kalinouski, a national hero and a revolutionary, the "Letters From under the Blanket" (Лісты з-пад коўдры, 2004), as well as the collection of vers libres written in Berlin, named "Berlibres" (Berlibry, 2008) and others. A poem presented by the author. Khadanovichs poetry combines modern elements of the urban dialect with the variety of the Belarusian language and is rich in stylistic experiments. Rozhovor s Chadanovičom a ďalšími autormi na témy ako politika, či básnické tradície. 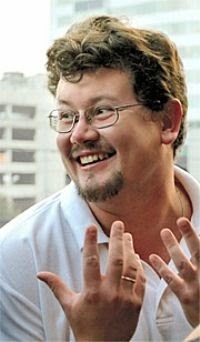 Khadanovich, born in 1973 in Minsk, graduated from the literary studies department of the University of Belarus in 1995. The poet, writer, translator and scholar is also president of the Belarussian Pen-Club. Khadanovich debuted as a poet in 2003, and has since published a new collection of poetry each year. His works have been translated into English, Czech, Spanish, Lithuanian, German, Slovak, Slovenian, Russian, Ukrainian and Italian. His own work as translator includes writings in English (Dickinson, Yeats, and Auden), Polish (Gałczyński, Miłosz, Herbert, and Twardowski), Russian (Brodsky, G. Ajgi and Siedokov), Ukrainian (Andrukhovich, Zhadan), and French (Baudelaire, Apollinaire). Zoznam publikácii Khadanovicha v ruskom jazyku. Rozhovor s autorom počas jeho návštevy v Paríži, v rádiu RFI. Autor radí, ako stráviť víkend so svojimi blízkymi. Tu si môžete pozrieť spevácke vystúpenie tohto autora. Profil autora na livejournal, kde aktívne prispieva, môžete si tu prečítať jeho tvorbu, autor tu pozýva na rôzne podujatia a tiež pridáva videá na ktorých číta z rôznych diel, naposledy napríklad z diela Vojna a mier.